Home Mysterious Past	Ancient Mayan Statue with QR Code Face. Aliens Warning Us? The ancient Mayan ruins of Mexico have nearly all, but a few, been excavated and their treasures placed in museums all over Mexico. However, what may come as a shock to many, is the statue with QR code face that may hold proof that aliens inhabitated our Earth any years ago. The statue has a face out of the ordinary. In fact, the face is a flat tablet, which looks remarkably like the QR codes we use in modern society to scan into our smart devices. There’s no doubt that its intention at the time was to enable people thousands of years later to use as a scanning code. Experts have come to the conclusion it is more likely a warning of some kind, maybe of a disaster forthcoming sometime in the future. News states “A photo of a statue with what looks like a QR code for a face has been making the rounds on social media, with some of the most imaginative people suggesting that it’s evidence of ancient aliens. QR codes were only invented in 1994. So this show us that the ancient aliens were able to time travel. We believe too that this is a QR CODE with a message from ancient aliens. Many people tried to scan the code,with no results. 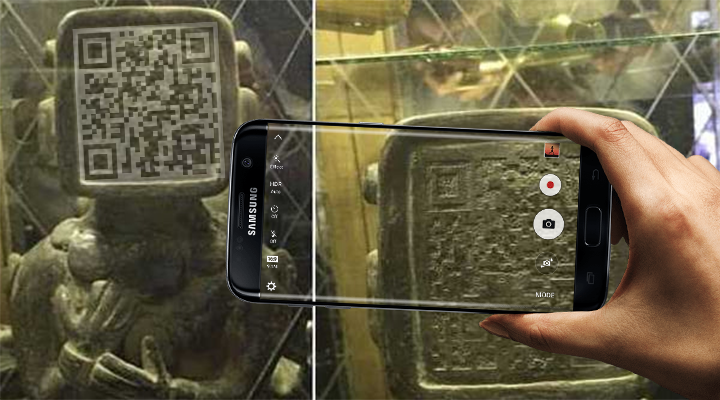 Also many were searching on Google for this statue… but they found hundreds of photos with different QR codes attached on the statue’s face, codes that are scamming people, those codes takes you to different donaton sites, online shop etc. The truth is that the statue is special , it contains a special message that we all are hoping to find out soon… or at least in this life. What do you think about the Statue with QR Code Face ?